Mastering project selection – which project should I choose? A key challenge in any innovation programme – be it creating a pipeline of new product proposals, selecting service/process re-engineering projects or deciding how best to allocate budget across multiple project proposals – is how to determine which projects are ‘best’ and therefore which to select. Managers are often faced with several possible projects and have to choose which to back, long before there is enough information to build a conventional business plan. Once a project proposal is sufficiently developed to include details of planned implementation, financial evaluation methods such as Net Present Value (NPV) can be applied. But for projects at earlier concept stages, “over-reliance on strictly financial criteria may lead to wrong decisions, simply because financial data are often wrong” – the words of Bob Cooper, who developed the stage-gate model for new product development. At this stage it can be tempting to simply fall back on intuition and previous experience but a better approach is to assess projects against a number of criteria which are pointers to likely success. 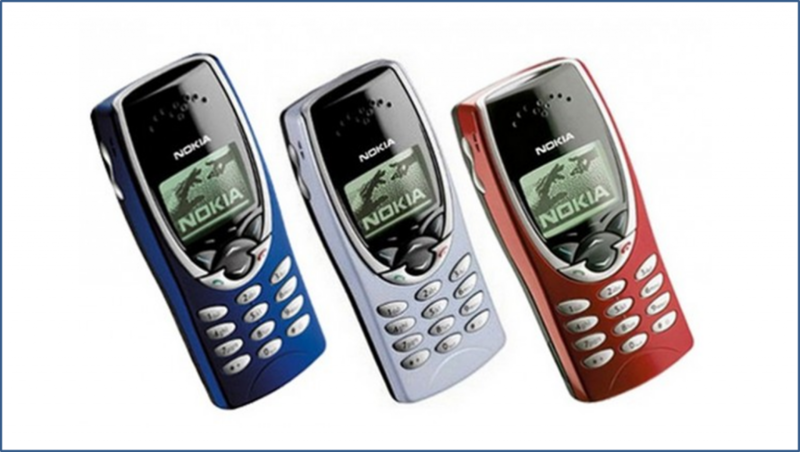 The second video in our series ‘Why great products are not enough’ covers Nokia and its fall from market dominance in mobile phones in 2005 to market exit less than 10 years later. There are key lessons to be learned from Nokia’s experience. In this video Alastair Ross reviews Nokia’s fall and analyses why and how it happened and the key weaknesses in Nokia’s business model and capabilities. Product development – are you good enough? Product development is a critical function for product-based businesses. The ability to develop new products with features and functionality that are valued by customers and users, to bring them to market quickly, cost effectively and at acceptable quality and then to support and enhance them during their lifetime has always been a complex undertaking. Today’s additional requirements to serve a global market, to exploit new technologies to meet ever higher customer expectations, to consider the opportunities for complementary digital services and to compete against new low cost, but increasingly high value, rivals from China and other emerging economies simply add to the challenge. In delivering new value propositions to the market, R&D management needs to be able to link research and technology possibilities with customer needs. It needs to have deep insight into the wants and needs of the users of its products and technologies. It needs to understand the unmet needs of users who are not yet its customers and where future growth can come from. It needs to be able to innovate to formulate technologies and product concepts that best meet these unmet needs, select the most promising and bring them to market. 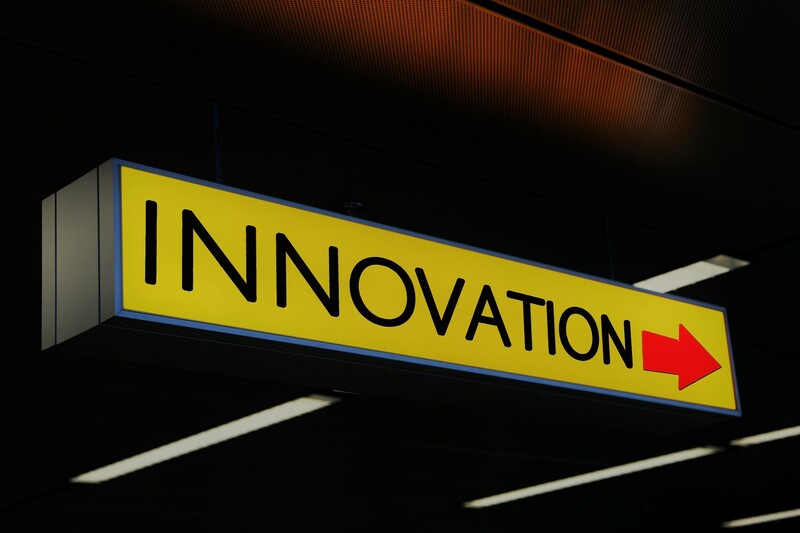 Is R&D creating value propositions that the market wants? A key measure here is the % of revenue from products launched in the last three years. If the % of revenue contributed by new products is low, then this indicates that the new product portfolio is not meeting user requirements in ways that are superior to the firm’s existing products – or rival products. This metric can be complemented by surveys among existing customers and also non-customers. In-depth understanding of user requirements (including unmet needs) and application knowledge are critical here. In meeting user needs, there is a balance to be struck between developing a new product and enhancing an existing one – or by providing a service-based solution. Increasingly digital services are playing a key role in meeting customer requirements. R&D operations now need to consider how to create ‘platforms’ that bring together hardware, software and service elements to meet user requirements in effective and reconfigurable ways that enable fast time to market. Does R&D bring new products to market quickly? Key measures here are: How does the firm’s time to market compare to rivals? Has time to market reduced over the past 5 years? A fast time to market enables a company to met emerging customer needs before rivals – and thus achieve a higher profitability whilst there is less competition. A focus on getting a ‘core product’ to market fast – and then follow with enhancements is an effective approach. Lessons can be learned here from the ‘Lean Startup’ movement regarding the use of the ‘Minimum Viable Product’ (MVP) approach. With the increased in servitization, user needs may be met by a software/digital service solution that is ‘wrapped around’ an existing product platform. Service-based solutions can be brought to market much faster than product-based ones. R&D Management need to decide how this service element is provided – internally or through partners. Is R&D on-time to market? Predictability is important – to fit with customer needs but also to align with the plans of internal support functions such as Manufacturing and Sales. Is R&D meeting defined project timescales? Failure to do so results in internal costs to replan and realign internal resources – with likely impacts on other products – and also can result in customer opportunities being missed. Is R&D delivering quality products? How well are new products meetings their target performance? What is the level of their reliability, measured by field failures and returns? Trading quality for a fast time to market is a short-term solution. New technologies will have inherent risks which need to be identified and addressed – through rigorous trial and testing – prior to their use in new products. Are products being developed by R&D within budget? This is key to R&D delivering across its portfolio of planned and existing products. If new products overrun their development budget, the shortfall is typically met by reducing the planned budgets on other products or projects. R&D management need to consider how to get the best ‘bang for the buck’ from their budget – which requires a strategic view of their product portfolio and key decisions to be made on ‘make v buy’ policy, in-house development v external, new product v enhanced existing product and product v service solution. An effective way to ensure that your R&D operation is ‘fit for purpose’ is to assess it against best practices and also to determine how well defined practices are deployed in daily work (e.g. is FMEA applied effectively, is application expertise embedded in concept development, are design reviews regularly held?). An outside view can be powerful in such assessments – bringing an independent eye and experience from other businesses and sectors. Codexx has performed a number of assessments of R&D operations in Western and Eastern Europe, China and the USA, making use of our licensed PROBE benchmarking solution for R&D and our F4i (‘Foundations for innovation’) assessment for innovation practices. We also worked with the Universities of Exeter and Aalborg between 2010-13 to study the ‘journey’ of new products from concept to market, covering 43 UK and Danish technology-based businesses, using a best practice model of the innovation journey. 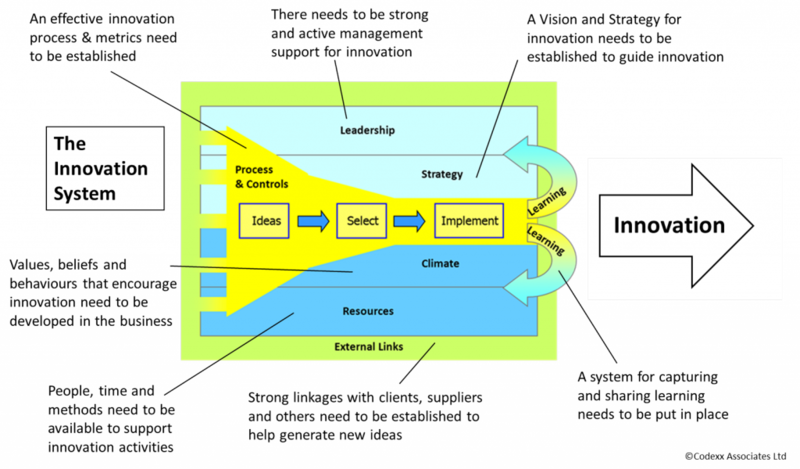 We have subsequently used this model to help companies assess their product development practices and performance. The core of this article is an excerpt from the forthcoming book ‘Sowing the seeds of business transformation’ by Alastair Ross, to be published in 2017. 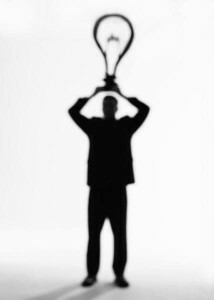 And the increasing level of competition (including new local and global rivals) mean that doing this profitably is often a challenge. The ‘old ways’ of developing services – informal and often ad hoc – that worked in the past will not be good enough in the future. Service businesses need to take a leaf out of the manufacturers’ cookbook for developing new products and create a new more structured and cohesive approach for developing complex services. To help clients in developing new services in today’s challenging business environment, Codexx has launched a new solution: ‘Structured Service Development‘ which is based on our work in complex services over the past 15 years where we have developed or re-engineered more than 25 services in multiple sectors including: legal, financial, consulting, environmental and industrial. For more information on this service read the solution flyer: Designing complex services – new Codexx offering – May 2016. If you would like to discuss how Codexx could support you in the development of new services, the re-engineering of existing services or in improving the management of service delivery, contact us. Product development is a critical function for product-based businesses. The ability to develop new products with features and functionality that are valued by users, to bring them to market quickly, cost effectively and at acceptable quality and then to support and enhance them during their lifetime has always been a complex undertaking. Today’s additional requirements to serve a global market, to exploit new technologies – including the opportunities provided by the internet – to meet ever higher customer expectations and to compete against new low cost, but increasingly high value, rivals from China and other emerging economies simply adds to the challenge. How do companies ensure that their product development practices are good enough? Become a user. Get the ‘voice of the user’ into R&D and keep it there. This can be done in a number of ways: by ensuring that development engineers and product managers spend time with relevant users, or by nominating a ‘user advocate’ in the development team, or by regularly and systematically bringing field feedback into R&D. A measure of the importance of this practice is that our innovation journey study found that end-user involvement in new product development was the practice with the fourth highest correlation with innovation performance. Effectively explore new ideas. This means using a rich approach to exploration that involves personnel from development, marketing and production as well as potential users and partners, to determine the potential user and business opportunities and also the risks of new concepts and to identify potential improvements. The use of rough-prototyping is very effective here to help evaluate the concept. This level of exploration ‘shakes up’ the concept to determine whether it has sufficient merits to consider taking it forward. In our innovation journey study of 2012-13, the effective use of rough prototyping for idea exploration was the practice with the second highest correlation with overall innovation performance. Enhance existing products. It can be easy for R&D to over-focus on new products, at the expense of enhancing existing products – from an engineering perspective it can be seen as less challenging and less exciting. But enhancing an existing product instead of investing in a new one has many advantages – less technical risk, less investment, easier for sales personnel to sell (minimal training required). Enhancements can be through updated technology elements in an existing platform, through accessories (which can be provided by 3rd parties) or through software and services. This does not mean we are ‘anti-new products’, but simply that the development investment portfolio should give sufficient weight to existing product enhancement as well as new products. Establish an ‘end-to-end’ product innovation process. Whilst most product businesses will have a formal New Product Development (NPD) process, this only covers part of the journey from new ideas to products in the market. 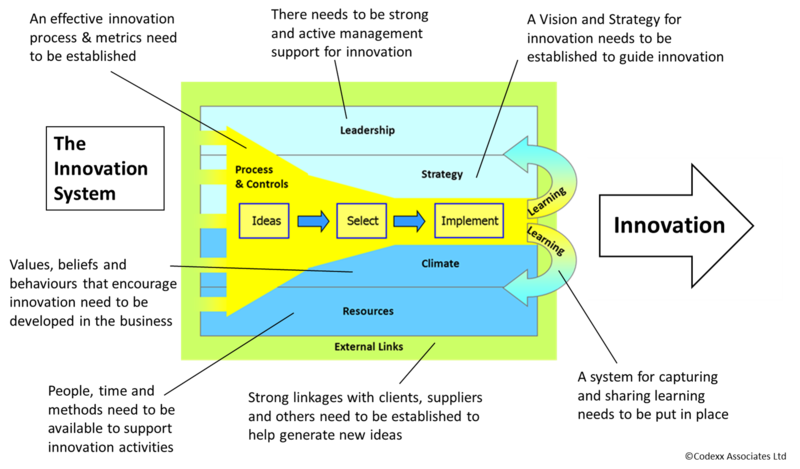 The NPD process needs to be complemented by a front-end process for idea generation and exploration (covering the key ‘fuzzy front end’ of product development), a back-end support & enhancement process and a parallel process for capturing learning from the field (as shown in Figure 1). Front-end exploration projects will often “fail” in the sense that the results are disappointing – which is an acceptable outcome as not all new ideas should (or can) proceed. Engineers must be judged on whether they do good, disciplined investigations in this stage, not on whether the ideas work out. Some element of waste is inevitable at the front end. Without such an end-to-end approach, the NPD process will waste resources on weak concepts and deliver sub-optimum products to the market. Product innovation must be guided by a clear stage gate process with an objective Go/No go at all the stage gates, especially, of course in the ‘Fuzzy Front’ end. Few companies are good at biting the bullet and stopping unpromising projects early on. But these processes have tendency to become more onerous with time as extra checks are inserted every time a problem occurs. This can become a bureaucratic nightmare. Beware of making the process any more formal than is absolutely necessary. Reduce development time and team size. A major proportion of development cost is engineering hours – and this is a function of team size and project duration. So short development times and small teams have many benefits. Small teams are easier to coordinate, require less project management time and thus are able to make faster decisions. Shorter development cycles are less likely to require specification ‘resets’ due to competitive product announcements, new technologies, regulatory changes or delays from resource shortages. Frankly long development cycles and large teams generate waste in lost time, rework and non-value-adding coordination. Philosophies such as ‘Lean Startup’ (see the book by Eric Reis of the same name) support fast development time as this enables products to get to market faster and then user-based learning can start. So the mantra ‘keep it short and keep it small’ should be the guide for product development. Employ platform thinking. This approach supports fast development time by introducing modular thinking into product design, to create a platform-based architecture. Thus new products become a mix of existing, evolved and new modules – for example a new mobile phone may have the same casing and screen, but updated processor, camera and new version of the operating system. This approach reduces development cost and risk and enables innovation to be focused on the new platform modules (rather than unnecessary re-invention). Platform thinking is well established in sectors such as automotive with cars such as the Volkswagen Golf and Audi A3 sharing much of the floorpan and chassis. Our innovation journey study showed that the separation of technology and product development (which is a key aspect of platform thinking) and the re-use of design or technology elements in new products were both top ten practices for correlation with overall innovation performance. Ensure development proven practices are deployed. There are some proven practices for the design of new products such as documented user requirements – to provide a firm base for specification, QFD (Quality Function Deployment) – to build a functional specification that is aligned with user requirements, FMEA (Failure Mode Effect Analysis) – to identify potential design weaknesses, Design Peer Reviews – to provide an independent ‘fresh view’ on a design before it is frozen and Post Project reviews – to capture lessons learned and required improvements to working methods. These good practices are well known, so it can be surprising how poorly these are in place in product development teams. We have been in firms where these practices have simply ‘faded away’ or only have ‘lip service’ paid to them. It is the responsibility of development management to ensure that these proven development practices are in place and used effectively. Don’t overload! Management ambitions can lead to the commitment of new projects and a development roadmap that simply exceeds development capacity. The result is a climate of project slippage and postponement – which further wastes development resources in re-planning and stop-start activities. Development capacity should not be loaded more than 80% of capacity to avoid short-term overloads of some resources and also to allow personnel time to get involved in new concept exploration work, platform development or other improvements. Overloading inevitably leads to queueing, and extra inefficiency comes if engineers need to swap from project to project. Have an effective Go/No Go to market. Stage-gate management in product development is a proven and effective way of managing cost and risk exposure. Just as cost and risk exposure significantly increase once a new product concept is accepted for development, so does cost and risk exposure increase significantly once a product is released to be taken to market as large investments in manufacturing and sales are required. This is why the decision to go/no go to market needs to involve all the key functions affected (such as marketing, sales, manufacturing and development) – it is not a decision for development management alone. Indeed marketing involvement in signoff of product release to market was the practice that had the highest correlation with high innovation performance in our innovation journey study. Thanks to Rick Mitchell, Visiting Professor of Innovation Management at the University of Cambridge for his contribution to this article. *‘The Innovation Journey for technology-rich product businesses – Phase 2 – Final study report’, October 2013, Codexx Associates Ltd, The University of Exeter Business School, The University of Aalborg Business School. More information. For further information on our innovation and product development solutions, contact us at www.codexx.com. You are currently browsing the archives for the Product Development category.